Last week, India's Human Resource Development Minister Kapil Sibal spoke of the possibilities for a $35 tablet for Indian students. In response, Nicholas published the open letter below in the Times of India. You can read it also in Spanish, French, and German. Please consider this open letter OLPC's pledge to provide India with free and open access to all of our technology, and our experience with 2 million laptops, in over 40 countries, in over 25 languages. As a humanitarian and charitable organization, we do not compete. We collaborate, and invite you to do so, too. Focus on children 6 to 12 years old. They are your nation's most precious natural resource. For primary school children, the tablet is not about computing or school, it is about hope. It makes passion the primary tool for learning. Your tablet should be the death of rote learning, not the tool of it. A creative society is built not on memorizing facts, but by learning learning itself. Drill and practice is a mechanism of the industrial age, when repetition and uniformity were systemic. The digital age is one of personalization, collaboration and appropriation. OLPC's approach to learning is called constructionism. We hope you adopt it too. Tablets are indeed the future. 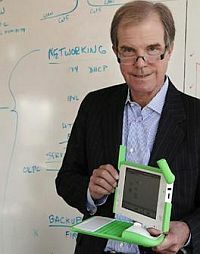 OLPC announced its own eight months ago. However, caution is needed with regard to one aspect of tablets: learning is not media consumption. It is about making things. The iPad is a consumptive tool by design. OLPC urges that you not make mistake. Hardware is simple. Less obvious is ruggedness, sunlight readability and low power. We use solar power because our laptop is by far the lowest power laptop on the planet. But do not overlook human power - hand cranking and other things that kids can do at night or when it rains. Just solar would be a mistake. Rugged means water resistant and droppable from 10 feet onto a stone floor. India is so big that you risk being satisfied with your internal market. Don't. The world needs your device and leadership. Your tablet is not an "answer" or "competitor" to OLPC's XO laptop. It is a member of a family dedicated to creating peace and prosperity through the transformation of education. In closing, I repeat my offer: full access to all of our technology, cost free. I urge you to send a team to MIT and OLPC at your earliest convenience so we can share our results with you. It doesn't surprise me that olpc is supporting India's $35 educational computer. A lot of people think NN started olpc in order to become a new Michael Dell and sell millions of computers. Actually, the purpose of olpc is to promote education in the developing world. The XO is just a means, and it was developed because nothing suitable was being produced. Having other parties producing cheap educational computers will just make it easier for olpc's goals to be achieved. How would someone include such a place as Kan Camaroon for the XO computer or the India tablet. I am a member of St Regis Catholic Church in Bloomfield MI and this is our sister church in Kan Camaroon.